Get ready for your kitchen to smell incredible. 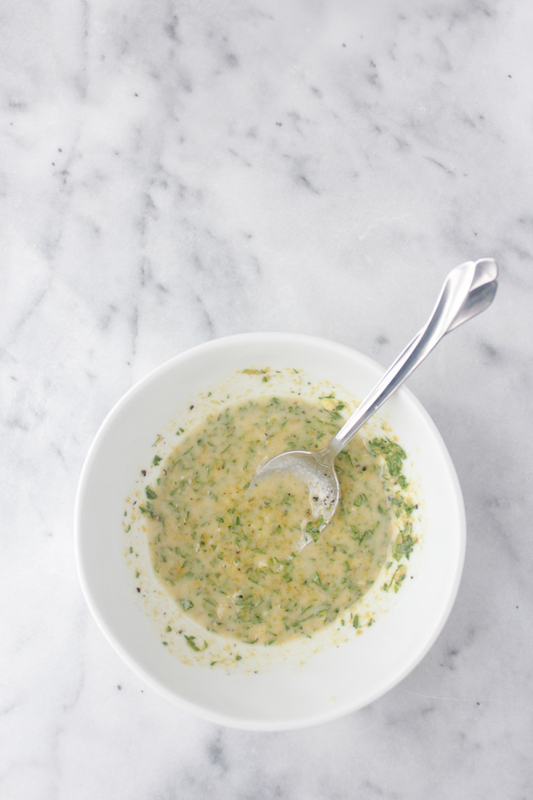 One of my favorite things to make for dinner is this broccoli soup from Deliciously Ella. It’s super bright, fresh, and full of veggie goodness, the only problem is it isn’t always enough to fill me up. Sometimes I would make roasted veggies or a side salad to go with it, but neither really seemed fitting. 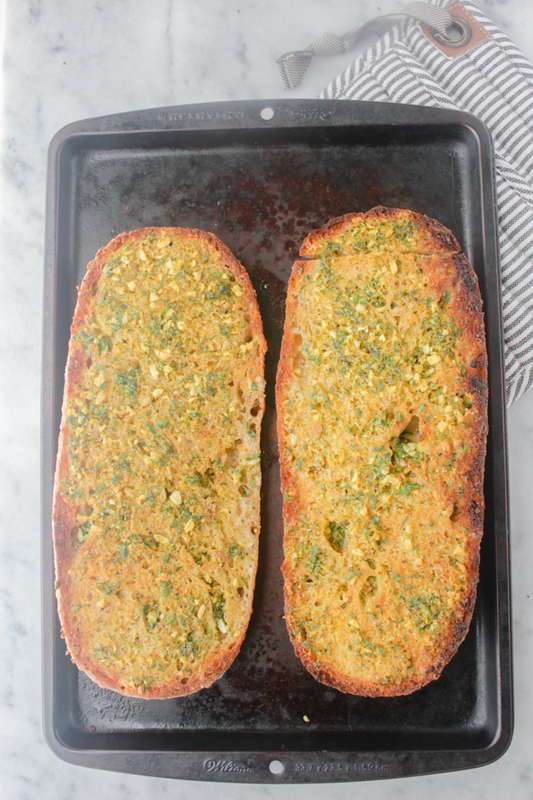 I knew I wanted to pair it with something super easy though, so I wasn’t stuck in the kitchen forever making two major meal components, and suddenly garlic bread hit me. Perusing Google for a good recipe, I was amazed by the huge variation in ingredients and techniques used for something that seemed so simple. Many of them looked overly complicated or a bit unappealing. Especially the ones that used garlic powder instead of fresh garlic. Why? Just, why? 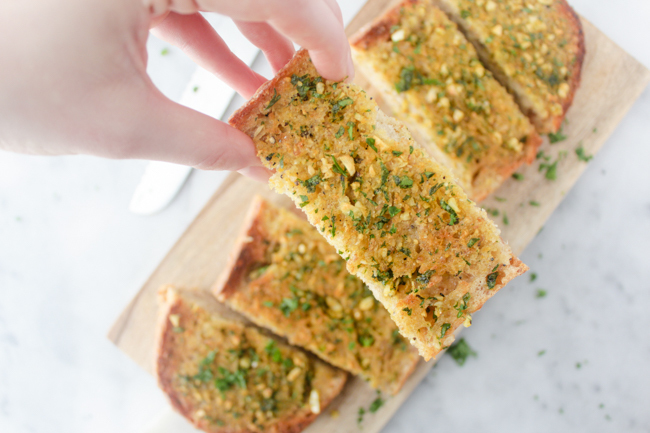 I set out to make the ultimate garlic bread recipe of my own that was truly delicious and easy to make. I started with the Harvest Multigrain Batard from the fresh bread section of Trader Joe’s. This is my all-time favorite bread. It has a delicious, nutty flavor and I love that you can see the seeds and grains when you cut into it. 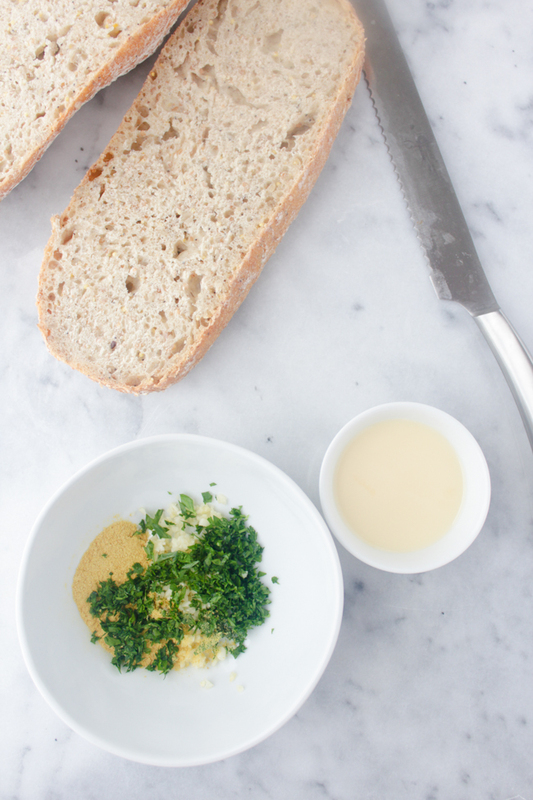 I then combine some melted Earth Balance, which is vegan butter you can find at any grocery store, fresh garlic, parsley and nutritional yeast for some cheeziness. If you're not into Earth Balance, I'm sure this would also work well with olive oil. I haven't tried it yet, but I'll experiment and let you know! The whole thing, including bake time, takes about 15 minutes and the result is oh-my-gosh good. Enjoy it right away or toss it in the freezer to heat up for future nights your craving something to go along with your soup, salad, pasta, or all on it's own. Preheat oven to 350 degrees. Melt Earth Balance in the microwave for about 20 seconds in a small bowl. Add garlic, parsley, nutritional yeast, salt and pepper and stir to combine. 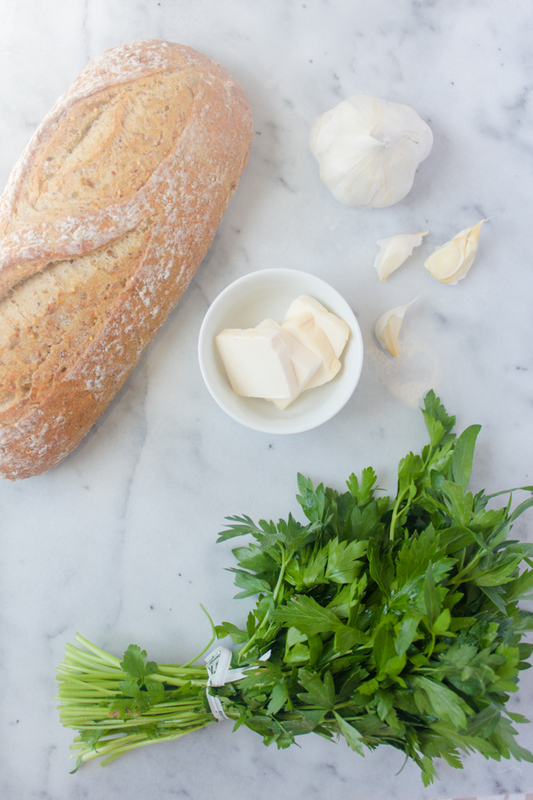 Cut the loaf of bread in half lengthwise and spread garlic butter evenly on the two halves. Bake in the oven for about 10 minutes then toast under the broiler for about 2 minutes, or until crispy and golden brown. Serve immediately or freeze once cooled. I love it too and yes, it is definitely the perfect thing to have when entertaining! It just goes so well with everything! YUM! 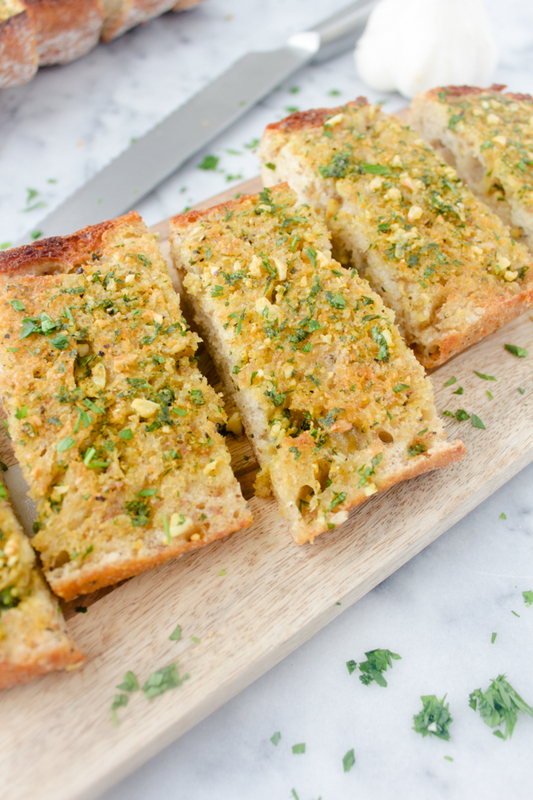 Garlic bread is my favorite - I'll have to make this. Thanks for sharing! Thanks, Lindsey! It's one of my favorites too. This looks delicious, need to try it out. Thank you! I would love to hear what you think! 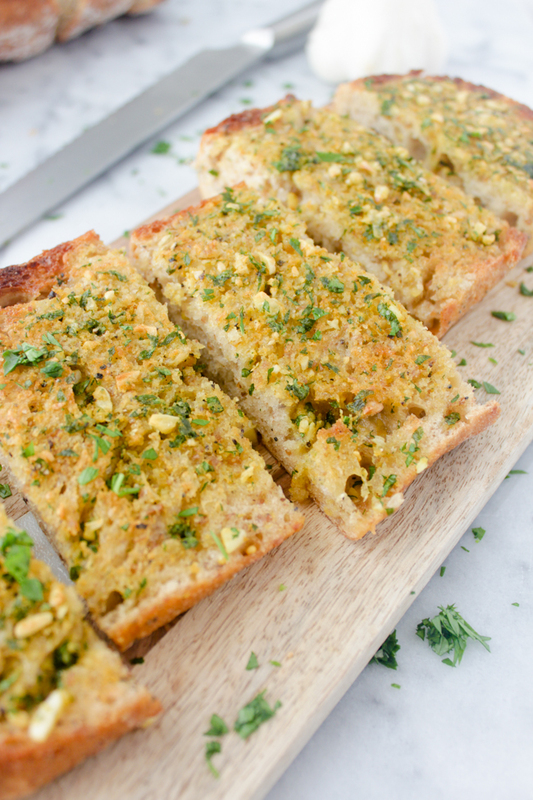 I love love love garlic bread, actually I am even a bit obsessed of it, lol! Therefore I love your post my dear! I have to admit, I always bought it ready but seeing this makes me wanna prepare it myself! Have an awesome Monday gorgeous! Thanks, love! 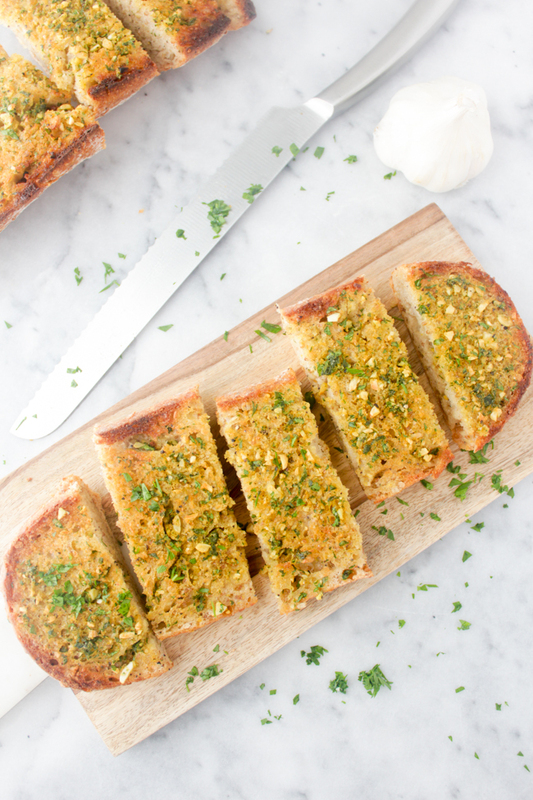 I am totally obsessed with garlic bread too, it just goes so well with everything! Making it on your own does take a bit longer than store bought, but it's totally worth it! omggg that looks dangerously amazing! I could eat the whole loaf! Oh gosh this looks so amazing! Will let my brother cook this for me haha :) Nice post Julia!